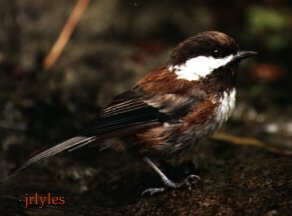 Here in the Willamette Valley, we enjoy the company of two species of Chickadee- the Black-capped Chickadee (Poecile atricapillus) and the Chestnut-backed Chickadee (Poecile rufescens). Have you ever wondered how these small birds can survive our long, cold winters without having to fly south? This article discusses the physiological and behavioral adaptations that Chickadees use as winter survival tactics. The greatest obstacle Chickadees face during the winter is staying warm. Like a little ball, small birds have a high surface area to volume ratio. As a result, they have a large surface area through which they can lose heat. In order to maintain their body temperatures, Chickadees must take in a large number of food calories which will be metabolized for body heat. 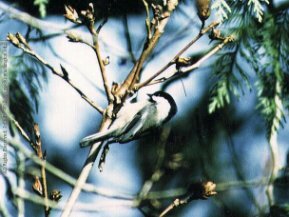 Calder (1974) notes that Black-capped Chickadees "... must eat continuously during short daylight hours to stoke their metabolic fires. If they do not, they will not reserve enough energy to see them through the long night." One challenge for Chickadees is that along with an increased need for food comes a decrease in the types of food which are available. Chickadees have a diet that consists primarily of insects, fruit, and seeds. During the winter months, fruit and some insects become scarce. In order to assist with winter foraging, Chickadees (like all birds) have evolved a beak which is suited for the harshest conditions faced by the bird. Because Chickadees depend heavily on the seeds of coniferous trees during the winter, they have evolved beaks which are well adapted for cracking small nuts. There are two reasons why Chickadees are so reliant on coniferous tree seeds: 1) the seeds are high in fat and oil content and 2) the seeds are available year round. We've all seen Chickadees eating seeds and berries but did you know that they also snack on dead animals? That's right, Chickadees have been seen eating fat from dead animals whose bodies have been opened up by larger predators and scavengers. These fat deposits are an excellent source of calories for Chickadees during the harsh winter months when food may be scarce. Last winter, I spent a few days snow camping at the foot of Mount Hood in Oregon. I was taking a winter wilderness survival class through the Coyote's Path wilderness survival school. At one point, I was watching a small flock of Chestnut-backed Chickadees foraging. Suddenly, Chris, the class instructor, did a very good imitation of a Coyote's howl nearby. I kid you not, immediately after Chris's howl, I heard one of the Chestnut-backed Chickadees imitate a Coyote. I know many of you may not believe me, but I am being entirely honest here. In the three years that I have done bird surveys, I have never heard any wild birds except Corvids imitate other species. You may be wondering why a Chickadee would bother imitating a Coyote. My theory is this: during the winter, Chickadees benefit greatly from scavenging on the fat deposits in carcasses. But chickadees depend on other animals to open up the carcasses. Because Coyotes can kill animals and open up their bodies, it is in the best interests of Chickadees to keep an eye on Coyote activities during the winter. The imitation of a Coyote's howl may have been the way these Chestnut- backed Chickadees alerted one another to the presence of Coyotes - and therefore, potential sources of food. In addition to increasing their food intake, Black-capped Chickadees have another trick for surviving the winter: they can lower their body temperatures by up to 14 degrees Fahrenheit at night to save energy. This drop in body temperature is a result of the birds' ability to decrease their metabolic rates. The fewer calories that are burned, the less energy that is created. Less energy means a lower body temperature. Black-capped Chickadees do not drop their body temperatures every night, though. This survival technique is usually saved for the most extreme cold weather fronts. It has been reported that Chickadees can turn their highly social nature into a survival tactic. During the long winter nights, Chickadees reportedly group together in logs and cavities (such as nest boxes) in order to conserve heat. By grouping together in a confined space, Chickadees are able to use their escaping body heat to warm the air around them and save a great deal of metabolic energy. This type of prolonged contact increases the likelihood of transmitting parasites and diseases between birds but the benefit of sharing body heat must outweigh the potential health risks. If you have lived in the Northwest for any amount of time, you probably know that one of the best ways to stay warm is to stay dry. Have you ever wondered how birds can spend hours in the rain without getting soaked to the bone? Chickadees (like most birds) have a special gland called the "preen gland" which is located on their backs near the base of the tail. When squeezed, this gland secretes a useful oil. Grant (1986) notes that "The [preen] oil apparently has several functions: to help keep the feathers flexible and waterproof and to inhibit the growth of fungi and bacteria." Birds use their beaks to squeeze oil from the preen gland and apply it to their feathers. A preening bird then uses its feet to spread the oil onto it head where the bird is unable to reach with its beak. When it comes to surviving the highly variable weather conditions of the Northwest, Chickadees are among the most resourceful resident birds. By adapting their physiology, adjusting their metabolisms, diet, and behavior, Chickadees are able to thrive in almost any condition our region has to offer. Calder, W.A. 1974. Consequences of body size for avian energetics. R.A. Paynter, Jr. (ed. ), Avian Energetics, Nuttal Orinithology Club, Publ. 15 Cambridge, MA, pp.86-151. Special thanks to Lauren Gerbrandt for his technical advice. Check out my webpage about a bird research project I worked on near Fairbanks, Alaska! During the last four years, I have worked on bird research projects for the University of Washington, the Alaska Bird Observatory and the Institute for Bird Populations . I am also a volunteer with the Portland, Oregon Audubon Society. Photography by John Wallace and James Lyles ---Thanks, guys!